Since ages, we have heard of revenge being a dish best served cold. The reality is something altogether different, though. While you may think that avenging injustice against you is perfectly normal and should be done with a clean mind, wouldn’t it tax your brain into overdrive, thinking about vengeances and retaliation? Why not be cool about it and let fate take its course. Trust me, fate would make vengeance much sweeter than the sweetest chocolate. Also, it wouldn’t keep you awake at night thinking if what you did was good, or bad. You don’t always have to be John Wick, you know? Hands down, the best thing about vengeance. You can frighten them into thinking that you would hurt them in a bad, bad way, while you are in a cafe, calming sipping on some frappucino. This would mess with their minds, and they would be constantly on the look out, imagining and projecting every incident as something bad against them. They would die a thousand deaths before they actually died. While you might be excited about cursing them into oblivion, keep in mind that every action has a reaction. They harmed you, they would be harmed. But if you harm them back, your credit would still be due, and you would be suitable harmed in the future. You might be the stealthiest criminal on earth, but fate would bring you to your knees. Why would you want that, when you can sleep in your king sized bed? Karma messes up everyone. You could be planning the greatest heist of all time, but karma would trump you with a meaner stick. So, why don’t you let karma work while it is gleefully planning your revenge? Learn to play the violin, work out, read some Dostoevsky, learn painting, and eat healthy, while Karma torments your victims to an edge in their lives. You might get a conscience after seeing them down and forlorn, but Karma never will. Vengeance and all is good but what if you don’t win? You can’t be that over-confident that you believe all wars need is a strong will. Your hatred and your desire for justice wouldn’t always make you the victor, and in the quite possible event that you do lose, what would you be? A sore loser, whom fate has kicked again and again for its own happiness? You would turn against the world, and that would be the end of you. 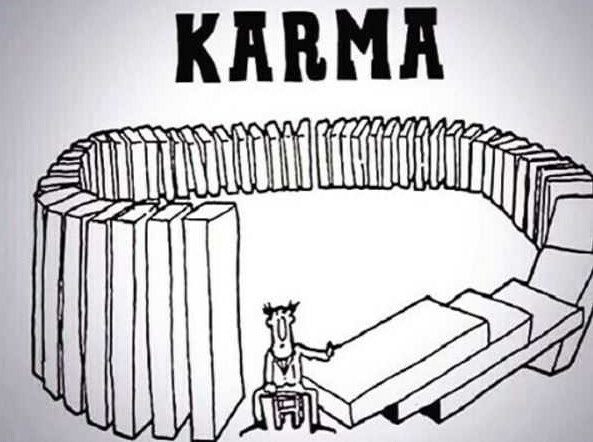 Why not, again, Let Karma decide what to do while you sit with a can of coke, and a tub of corn, and watch the show? Revenge is indeed a dish best served cold, but only when you let Karma cool it and serve it. Trying to tempt fate by taking matters in your hands would never be as successful as you would dream it to be.